RV camping at Movin’ West RV Park puts you within walking distance of all the town’s shops. It is really easy to walk to the Graeagle Mill pond to swim. Of course that is if you are the type that just takes your swim suit and a towel. If you want to take the kids, lunch and all the things that go with that excursion a vehicle will work better. 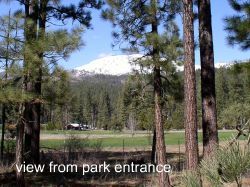 The Park is located in eastern Plumas County within a quarter of a mile of downtown Graeagle. You will recognize us on your arrival by the stage coach and sign out front. Our elevation is at approximately 4500 feet in the high sierra which means that your visit with us will most likely be several degrees cooler than where your home is. A lot of our campers use GPS to find us so let me give you our coordinates. The reason I give them to you is that if you type in 305 Johnsville you will go about five miles past our location and end up at a dead end in the town of Johnsville. Now while this is a great little gold mining town to visit you really don’t want to find it at nine o’clock some Friday evening after work. It is not all that much fun to have to back track. We are in the Mohawk Valley, so any direction you look you will see mountains. Like this view from our front drive of Penman Peak. There is not snow on the peak during the summer but it is a very pretty site to see. If you want to see snow on the mountains around you show up in early May. There is so much within just a few miles of us that the roads are usually still not completely plowed out. You can drive to the edge of the snow and play and get a sun burn all at once. Our Graaeagle RV camping season is from May 1st until October 30th. This allows us to share the best of our spring,summer, and fall seasons with you. Every season has something special. There is excellent fishing, beautiful spring and summer flowers, and spectacular views. Go hiking, swimming, drive the 4x4 trails in the Plumas National Forest in summer. Enjoy the Fall colors in late October. There are fewer people in the fall. You will have the golf courses to yourself, and the fishing picks back up as the nights cool. RV camping here at Movin’ West puts you in the center of any activity that you want to participate in. Family camping is easy here, we have two cabins and are the only RV Park locally to also offer tent camping. This makes it easy for families to stay at one location when not everyone has a RV. Last but not least Camping with us at Movin' West RV Park is a quiet, peaceful opportunity to take that much deserved time away from the daily cares of life. Take time to read that book, lay back in your chair and look up into the tall pines. Sleep away a long lazy summer afternoon. Do only what you want when you want, and enjoy a nice relaxing meal at one of our fine restaurants. You deserve it!!!! "RV Camping Sites" -Use Movin’ West RV Park as your home base, while sampling the spectacular beauty and enjoying the many family vacation activities Graeagle has to offer. "Vacation Cabins For Rent" -The cabins are located within easy walking distance of downtown Graeagle. Enjoy nights under the stars and days exploring the high sierra. "Tent Camping" -The closest Family Tent Camping to the town of Graeagle. "RV Park Reviews" -A place to share your Thoughts about Movin' West RV Park, or to share other RV Parks that you think our guests might enjoy. "Directions" -Directions to Movin' West RV Park. "Best Family Vacation Destination" -A short one hour drive from Reno to Graeagle will allow you to enjoy a great weekend family vacation. "Fun Affordable Family Vacations" -Majestic mountains, fifty or more fabulous lakes, fishing and hiking. Play championship Golf, drive a locomotive, or just lay back and look at the sky. "Movin' West Park Rates" -nightly, Weekly, Monthly. 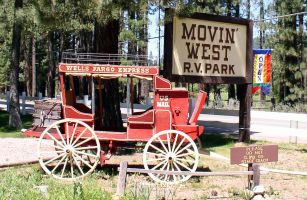 "Movin' West Park rules" -For most these are just guidelines as you understand the common courtesy that makes staying in an RV Park fun and enjoyable. 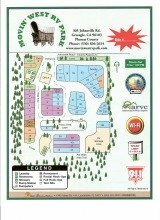 "cancellation policy and advanced deposits"
"RV Park Map" -The Park map is for you to get an idea of our RV camping Parks layout.